Unless they act, most states will not conform to an important pro-growth element of federal tax reform, the provision providing for immediate expensing of investments in machinery and equipment. The additional revenue from base broadening elsewhere—including restrictions on interest deductibility—may provide an opportunity to conform to this provision. In aggregate, the base-broadening provisions are worth considerably more than the base-narrowing ones, particularly within the individual income tax code. Each provision changed at the federal level has varying impacts on states, though, and each will be considered in turn. In the tables that follow, provisions where conformity is expected to increase state revenue are indicated with a (+) and those where conformity may result in a loss of revenue are denoted with a (-). As state legislators grapple with what these provisions mean for their state, it is vital that state fiscal offices provide estimates of the effects of each relevant provision. State and local individual income taxes account for 23.5 percent of state and local government tax collections nationwide, compared to the 3.7 percent which comes from corporate income taxes. Consequently, even though the 2017 federal tax reform bill made more changes to corporate than personal taxation, the latter are of far greater significance to state government finances. At the federal level, individuals will receive the benefit of a higher standard deduction, rate cuts (along with broader bracket widths), a more generous child tax credit, and a higher alternative minimum tax (AMT) exemption threshold. 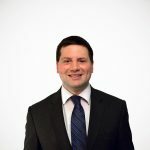 To help pay for these changes, the personal exemption has been repealed, the state and local tax deduction is capped at $10,000, the mortgage interest deduction now applies to the first $750,000 of principal value (down from $1 million) and was eliminated for home equity indebtedness in its entirety, and several deductions were eliminated outright. The vast majority of filers will receive a tax cut at the federal level,  but because base-broadening measures flow through to many states, while rate reductions do not, they could easily see a state tax increase unless states act to prevent one. Although each has its own additions and subtractions, twenty-nine states and the District of Columbia use federal adjusted gross income (AGI) as their starting point for calculating individual income tax liability. Another six states (Colorado, Idaho, Minnesota, North Dakota, Oregon, and South Carolina) use federal taxable income. The remaining six states which tax wage income  use state-specific definitions of income, although they incorporate some IRC provisions into these definitions. 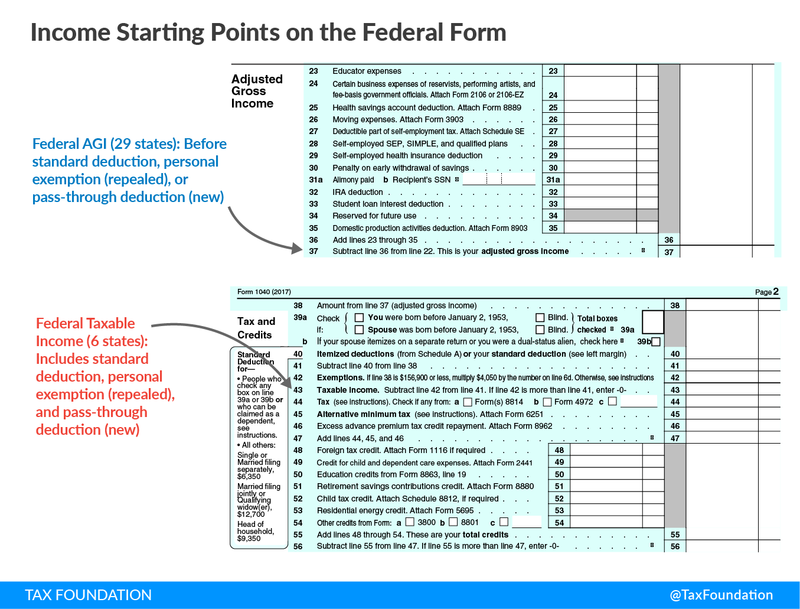 Electing federal taxable income as a starting point for state income taxes has the effect of incorporating federal standard and itemized deductions, the personal exemption, and a new deduction for qualified pass-through business income, unless the state expressly decouples from these provisions. Each of these elements will be considered separately. 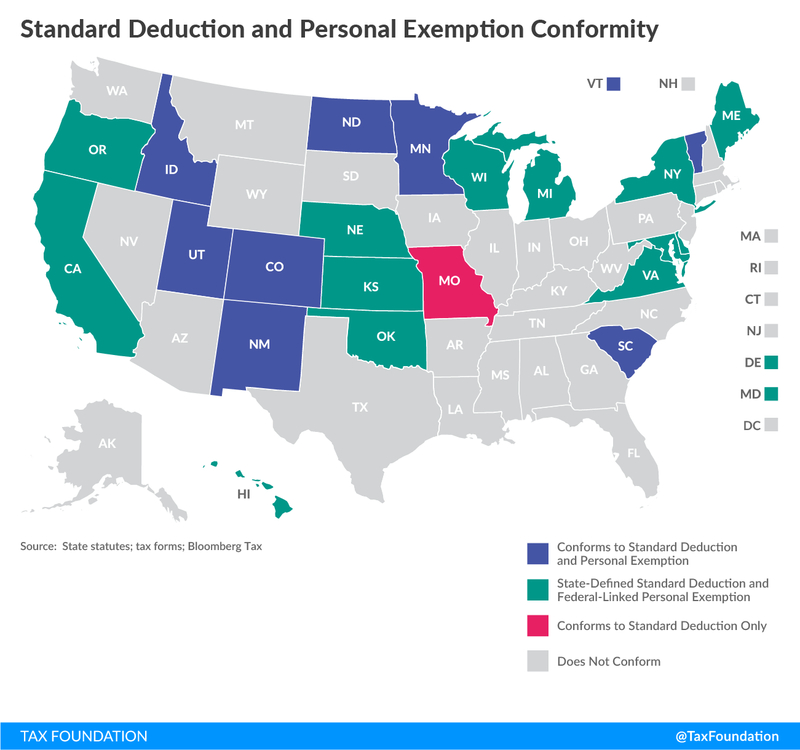 The seven states (Colorado, Idaho, Minnesota, New Mexico, North Dakota, South Carolina, and Vermont) that conform on both the standard deduction and personal exemption will experience base broadening, as the standard deduction roughly doubles but the personal exemption is repealed. Missouri, which conforms to the standard deduction but only partially to the personal exemption,  could see a revenue loss, while Maine, which conforms to the personal exemption and not the standard deduction, could experience a larger revenue gain. Utah offers credits worth 6 percent of the value of federal deductions and exemptions, and will see a revenue increase due to this proportionality. 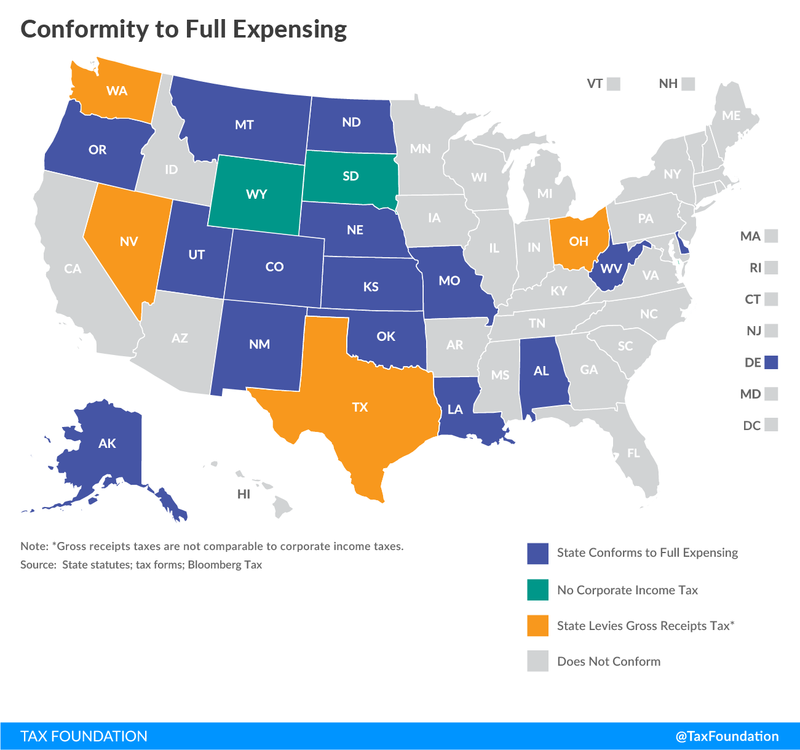 Another twelve states offer their own state-defined standard deductions and personal exemptions, but multiply their state-defined personal exemption by the number of exemptions claimed at the federal level. Since the exemption no longer exists at the federal level, this has the practical effect of repealing these states’ personal exemptions unless amended to base the exemptions on the number of dependents claimed, rather than the number of exemptions taken on one’s federal return. 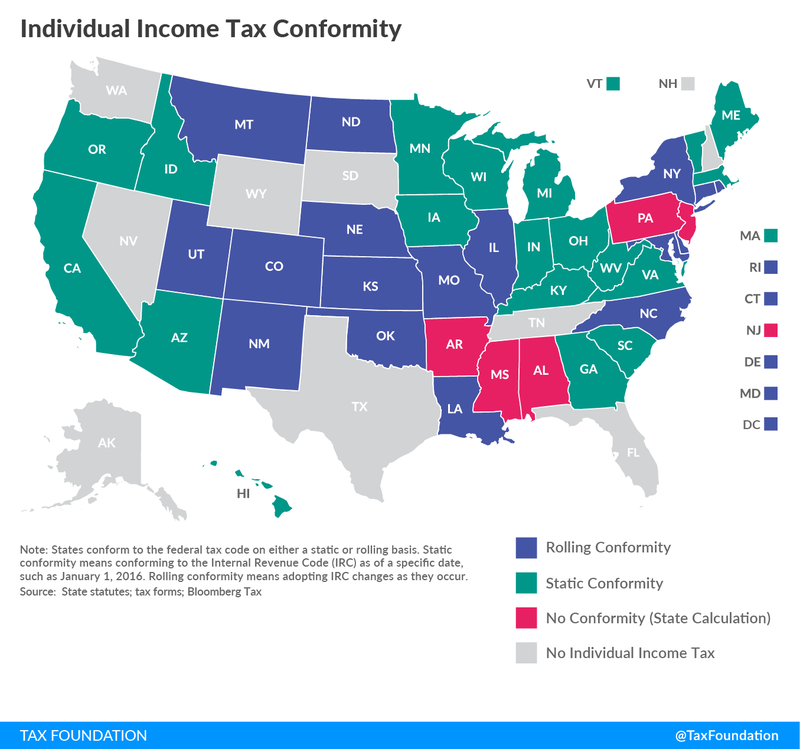 Notably, five of these states (California, Hawaii, Oregon, Virginia, and Wisconsin) use static rather than rolling conformity, but would still experience an immediate impact, because the number of exemptions taken on the federal return will be zero without regard to whether a state conforms to the new provisions. In one of those twelve states, Nebraska, the standard deduction takes the form of the lesser of a state-defined standard deduction or the federal standard deduction. Whereas the federal standard deduction has been the lower of the two since this provision was adopted in 2007,  the state-defined deduction is now the lower due to the expanded standard deduction under federal tax reform. Consequently, Nebraska’s standard deduction will rise to the inflation-adjusted level of its own standard deduction (about $6,700 for single filers) rather than mirroring the new federal level ($12,000). Federal tax reform doubled the size of the child tax credit, from $1,000 to $2,000, while dramatically increasing the refundable share, to $1,400. The credit is also available to a much wider range of taxpayers, since income phaseout thresholds rose dramatically. At the federal level, the much larger child tax credit, along with a new $500 per-person family tax credit for dependents not eligible for the child tax credit, more than offsets the loss of the personal exemption for many filers. Most states, however, do not offer such credits and would not automatically conform to the provision, meaning that they gain (in many cases) from the repeal of the personal exemption without any obligation associated with the expanded child tax credit. However, three states—Colorado, New York, and Oklahoma —offer child tax credits linked to a percentage of the federal credit (for instance, Colorado offers a credit in the amount of 30 percent of the value of the federal credit). The expanded credit would represent a cost to these states if they do not decouple or reduce the percentage at which they match the federal provision. The Joint Committee on Taxation estimates that the deduction will cost the federal government $414.5 billion over the next ten years, so states which conform to the provision could face a meaningful revenue loss. Consequently, it has understandably emerged as a point of consternation. A state’s individual income starting point determines whether pass-through businesses will receive the benefit of the deduction at the state as well as the federal level. Crucially, it is structured as a deduction against taxable income, not adjusted gross income. As such, it would be incorporated into the tax codes of Colorado, Idaho, Minnesota, North Dakota, Oregon,  and South Carolina, which use federal taxable income as the starting point in determining state tax liability. Federal law now restricts the deduction of business interest, limiting the deduction to 30 percent of modified income, with the ability to carry the remainder forward to future tax years. For the first four years, the definition of modified income is earnings before interest, taxes, depreciation, and amortization (EBITDA); afterwards, a more restrictive standard of gross income less depreciation or amortization (EBIT) goes into effect. These changes mean that a greater share of interest costs will be taxable, increasing revenue. Every state except Mississippi conforms to the federal definition of interest expense. Given this change, which increases the cost of investment, states would do well to ensure that they also conform to the new full expensing provision. American corporations ended 2017 with about $2.6 trillion in overseas earnings that have not been transferred back into the United States. Under the old “worldwide” system of taxation, U.S. corporations paid the difference between the U.S. statutory corporate income tax of 35 percent and the effective rate in the other nation where the income was earned. However, that liability was deferred so long as the income was not repatriated. As part of the transition to a territorial tax code, these deferred earnings were “deemed” to have been repatriated, meaning they are immediately taxable by the federal government at rates of 15.5 percent on liquid assets and 8.0 percent on illiquid assets. This repatriated income is categorized as Subpart F income. The six states which use federal taxable income as their income starting point (Colorado, Idaho, Minnesota, North Dakota, Oregon, and South Carolina) are the most likely to experience revenue losses, since these states would incorporate the new pass-through deduction absent legislation to the contrary. Missouri, which will adopt the much-higher federal standard deduction while dropping a relatively modest personal exemption credit, may also be positioned to lose revenue. Most states can expect additional revenue due to base-broadening provisions of federal tax reform. Although this additional revenue will not match the windfall experienced after tax reform in 1986, when all but one state with an individual income tax conformed the subsequent year,  the increases will be substantial for some states, particularly those which conform to the now-repealed federal personal exemption. A few states, chiefly those which begin their individual income tax calculations with federal taxable income rather than federal adjusted gross income, may stand to lose revenue absent changes to their tax codes. In the aftermath of the Tax Reform Act of 1986, eighteen states reduced individual income tax rates, twenty-three increased the standard deduction, and twenty-two increased the personal exemption, among other changes. In 2018, anticipated revenue changes will be smaller, but states will still have an opportunity to avoid an unintentional tax increase by adopting individual and corporate income tax cuts. A less desirable option would be to decouple from federal provisions responsible for the additional revenue. As a far superior consideration, they could view federal tax reform as a golden opportunity to reform their own tax codes. After 1986, nine states (Arizona, Colorado, Kansas, Maine, Minnesota, Nebraska, New York, North Carolina, and West Virginia) overhauled their individual income taxes entirely. A smaller number of states made substantial changes to corporate income taxes. That opportunity exists in 2018 as well.